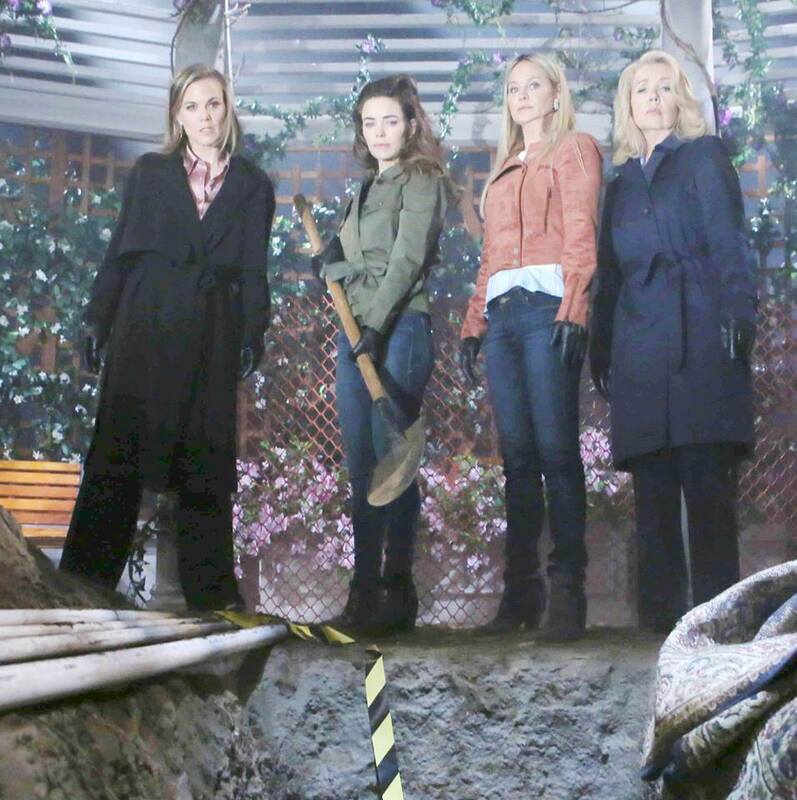 The walls are closing in on the ladies on "The Young and the Restless." HOLLYWOOD—Hallelujah, after close to 9 months of waiting and patiently waiting for the secret to finally come to life on “The Young and the Restless” about Phyllis, Sharon, Nikki and Victoria’s role in the demise of J.T. Hellstrom. Nikki confessed to Nick about her role in killing J.T. and hiding the body to protect Victoria. That secret was later spilled to Victor who seemed to be hell bent on doing everything in his power to protect his wife and daughter. There is one major hiccup: Nick and Victor suspect that a tormentor is indeed out there, the question is they have no clue who that individual is. As a viewer, we know whoever the individual is has cameras inside the Newman ranch and are watching their every move. I want to say its J.T., but the more I think about it, that seems way too easy. If the writers really want to deliver a curveball to the audience they’d reveal the tormentor as someone else. If you were to ask me 3 months ago, I would be adamant that J.T. is alive and the ladies tormentor, now, I’m not so certain about that theory. Why is this interesting? Phyllis is more nervous than ever with Victor being out on bail and she wanted to partner with Sharon, whose husband to be (Nick) she slept with and destroyed her relationship for the second time. It was laughable watching Phyllis plead her case to Sharon who wasn’t buying things being sold to her. With February sweeps fast-approaching, this secret has to come out or at the very least the audience finally puts a face to the ladies tormentor. If it is indeed J.T., I will not be that surprised, but if it turns out to be someone else and someone I never expected that might be a twist that leaves audiences aghast to say the least. In a story that came out of left field, the chemistry between Cane and Victoria is heating up. I mean that first kiss was a shocker, but the recent one left me aghast. Why? It looked like Cane and Victoria were about to commit the deed, but Billy Abbott interrupted things. It led to massive fallout as Billy called out his brother for his antics, and Vicky didn’t apologize for her transgressions. Billy was livid and wanted vengeance on his brother, so what did he do? He decided to hop on a plane to visit Lily in prison. Billy spilled all the tea to Lily about Cane hooking up with Victoria. Lily was devastated and I can understand why? The first time Cane cheated on her it broke her heart and ripped their marriage apart. This time around, not only did he cheat on her, but he did it while she’s locked away in a prison cell. Cane wanted to plead his case to Lily before Billy could, but too late. He was furious with Billy and as a result he delivered a punch to his face. Looks like the rivalry between Cane and Billy has ignited once again and in a major way. In other news, I cannot believe Arturo cheated on Abby with Mia of all people. I mean the guy seemed so happy and he’s about to toss his relationship away for his first love that can’t stand the sight of. This love triangle is a complete mess between brothers. Arturo wanted to confess the truth, but Mia threatened that he could lose his relationship with his brother forever. I do agree with that assertion because Rey has finally locked away his feelings for Sharon, but when he learns what Mia and Arturo have been up to, not only is he tossing Mia to the curb, he might deliver a punch or two to his brothers’ face before giving into temptation with Sharon, who has been quite patient to say the least. Mia’s hopes of having a glorious wedding renewal was about to blow up in flames. Why? Guilt, it always eats a person alive and Arturo was feeling guilty as hell, while Mia didn’t seem to have a care in the world America. In the soap world, we all know no wedding ever goes off without a major secret or bomb being revealed. So it was nice to see Mia receive her comeuppance. We have to discuss the juiciest Intel of the week, the person planting evidence and framing Victor was none other than Phyllis. Gosh, will this woman ever learn. I knew it from the very start that she would be the first to turn on the group. Phyllis cares about one person and only one person: HERSELF. So much for her relationship with Nick, Victoria, Nikki and Sharon. Oh, she might also find herself in a predicament where her position at Jabot blows up in flames also.